A London cyclist, who was among hundreds who rode from Grand Bend to London Sunday in a fundraiser for the Multiple Sclerosis Society of Canada, is frustrated after being stopped and issued a ticket by provincial police. London cyclist Sara Gallien said she was given a $110 dollar ticket for failing to come to a complete stop during a charity ride for the Multiple Sclerosis Society of Canada. A London cyclist who was among hundreds who rode from Grand Bend to London Sunday in a fundraiser for the Multiple Sclerosis Society of Canada is frustrated after being stopped and issued a ticket by provincial police. 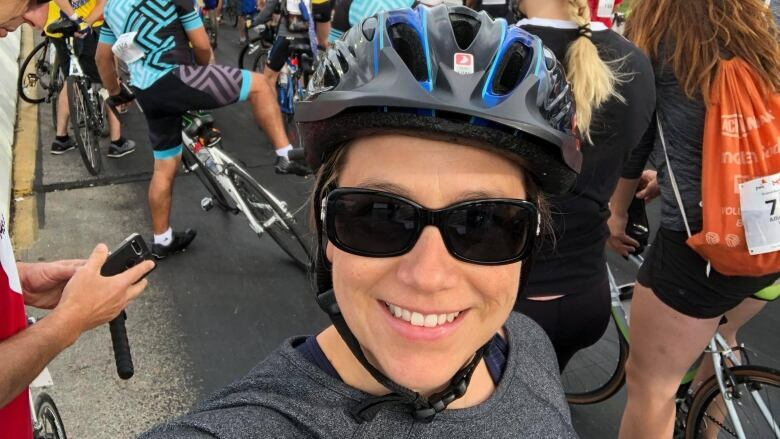 Sara Gallien said she was about halfway through the Gear Up to End MS ride when the group she was with reached an intersection near Ailsa Craig. The 43-year-old cyclist said she and others treated the stop sign as a yield sign and looked for cars before proceeding. But she was the only one who got a ticket for $110. As the group crossed the roadway, Gallien said an OPP officer pulled them over and started questioning them. "And then I said, 'I don't know why you're doing this at a charity event, pulling people over'. And I don't think he liked that very much. " Gallien said the officer let the other cyclists go, "but he gave me a ticket for questioning him about it." She quoted the officer as saying he was trying to educate people on the rules of the road. But she said all it did was create animosity on the part of the cyclists in her group. "I think it was sort of a dirty trick for him to set up his operation there to stop people during a charity ride." Gallien said there was no need for the cyclists to come to a complete stop because it had been determined that it was safe to go. "Having them all stop one by one at the stop sign, really doesn't make that much sense. "There was absolutely no danger to me or the other people. There were no cars…I could see probably a mile in all three directions, and there was absolutely no traffic." Gallien thinks the incident points to the need for changing the Ontario Highway Traffic Act. She said bikes can stop much faster than a car or truck. "So when you have that kind of fine control, I don't think [coming to a complete stop] is really necessary." When asked to comment on Gallien's concerns, OPP Western Region Acting Sgt. Kevin Martin issued a written statement saying "...an officer's top priorities are public safety and law enforcement. Any discretion an officer exercises on the job is expected to align with these priorities." He said an officer's discretionary use of enforcement is dictated by factors in each situation. And, he added, officers who exercise discretion are accountable for their decisions. He said Gallien has the option of speaking to a supervisor or can contact the Office of the Independent Police Review Directorate. The OIPRD is a civilian agency that oversees all complaints about police in Ontario. The agency says it ensures that complaints are dealt with in a manner that is transparent, effective and fair. Meanwhile, Gallien says she will probably have to pay the ticket because of the way the Highway Traffic Act is currently worded, and she hasn't decided yet whether to pursue the matter further. Organizers of the 150 kilometre ride from Grand Bend to London and back said participants raised more than $1.4 million to fight Multiple Sclerosis.